Carrie Brownstein sings their praises in interviews about Portland. Techies like Gizmodo geek out over them. One of their baristas just won the 2012 Northwest Regional Barista and Brewers Cup. And now, of course, the New York Times has joined in with a glowing review in last weekend’s Travel section. No question: Coava Coffee has put itself, and Portland coffee, on the map through a number of innovations. 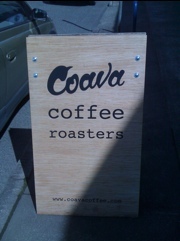 Locations: Coava Coffee Roasters occupies a spacious corner at1300 SE Grand Avenue. Like many other craft roasters in town, Coava has an antique roaster parked in the middle of its shop and offers micro-roasted beans in brown paper bags (differentiating with a focus on single origin, rather than blends). 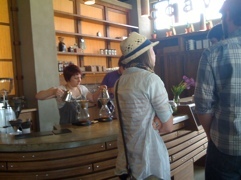 They’re also among a handful of shops in Portland that have specialized in the pour-over coffee movement. But where this roaster is even more different than the others is that they not only roast and pour a great cup of coffee, in 2010 Coava introduced the Kone, a revolutionary, reusable metal mesh filter designed for glass, drip coffeemakers like the Chemex. A few weeks back, I splurged and finally bought myself a Kone. Check back soon for Part II of this post and my experience at home with the Kone. 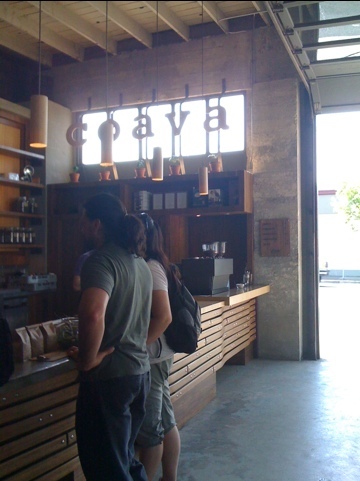 Keep reading for a brief review of my impressions of Coava, the café. Coffee: I’ve had Coava-roasted coffee several times as espresso as well as pour-over coffee. Until recently, I have to say I favored their Americanos, which may just be because I like espresso best. But this winter, I dropped in for a pour-over cup, and it was truly a delicious experience. From the rum-chocolate-flavored Finca Zarcero drip coffee from Costa Rica chosen for my drink to the way the barista carefully explained the method behind this particular pour-over coffee, I thoroughly enjoyed my coffee and left excited to try it out at home with my new Kone filter. Cool stuff: Aesthetically, Coava’s coffee shop is an incredible space with large windows, high ceilings and bamboo wood accents. The baristas are friendly and knowledgeable and more than willing to share their expertise while brewing a fine cup of coffee. The wooden coffee bar looks like an experiment in mid-century design adorned with glass coffee pots just waiting to be poured over. Not so cool: The metal school chairs and stools make it a little tough to cozy up with a coffee and a book or your laptop. Many people do, but I tend to get my coffee to go or end up drinking while standing up.